When we first arrived in Australia, we lived in Adelaide and one of the favourite things that my mother cooked when we had guests, was vitello arrosto (roast veal). It was not vitello as we had been used to in Trieste (veal which was very pale in colour and young), however, we were very fortunate to have a good Hungarian butcher who did his best to supply us with cuts of meat that we were better acquainted with. When I was a teenager I often had friends who came to stay and I used to tell them that what we were eating was roast veal, they were confused. Firstly because it was not roast lamb (my mother thought the lamb as pecorona – ultra big sheep), but secondly because it was not roast cooked in the oven, so why did we call it roast? Ovens were not commonly used, baking was not common, but wet roasting was, and if you look at recipes for vitello arrosto you will find that the most common way of cooking it is in a pan with a close fitting lid on top of the stove. The juices do not dry out and the roast will be tender and very flavourful. This is not a recipe my Sicilian relatives cooked – their arrosto was cooked slowly in the oven, with onions, a little tomato, bay leaves and usually with potatoes. This was also moist and cooked for some of the time partly covered. 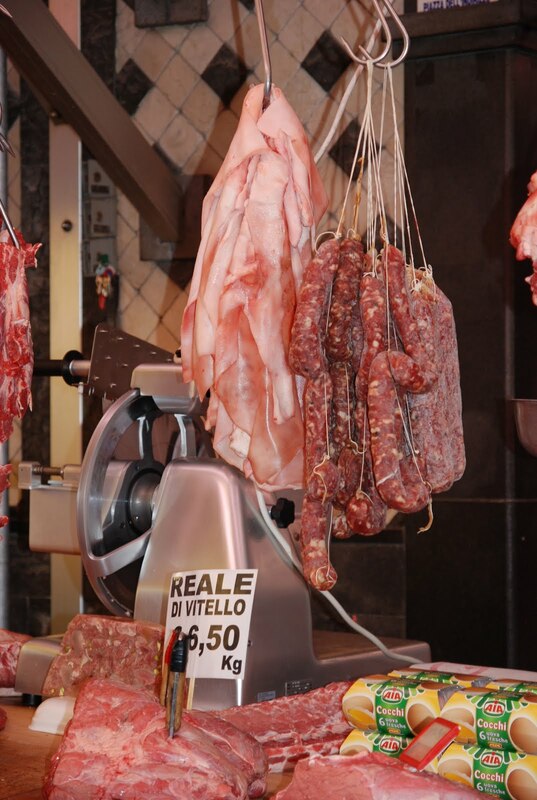 The photo was taken in Sicily; the cut of meat that my relatives often use for a boneless roast is called a reale. Ask your butcher for a piece of veal that you can roast. A girello is suitable, but it is more likely to be yearling beef (most Australian butchers label this piece of meat as such, if not it is also called silverside – but not pickled). A leg of veal is also suitable, but it will be gelatinous and not every one likes this. The pan often called a Dutch oven, is a good shape to use for vitello arrosto. Make holes in the meat (use a sharp, thin knife) and stud the meat with the flavourings – use separate flavours for each hole. Heat the oil, brown the meat well on all sides. Pour in 1 cup of the wine and evaporate. Add the onion and carrots, a few more sprigs of rosemary and sage, salt and pepper. Cover and cook over low heat for about 1½ hours, but keep on adding a little more wine (or stock) so that the meat is kept moist and does not stick to the bottom of the pan (add extra water or stock if necessary). When the meat is cooked, cut the roast into thin slices and serve it with the sauce (I always include the bits of onion and carrots, some cooks use a mouli to passare (grind/ mash) the vegetables into the sauce. My mother always presented the veal with spinach sauteed in butter and nutmeg and patate in teccia…but these are part of another story.